Clan Badge: A cross crosslet fitchee gules, surmounted by a sword in saltire proper. The history of the Adam name is well recognised, with Adam, Sub-Prior of Melrose being listed as Abbot of Cupar in 1189, and an Adam son of Adam as witness to to a charter by William Bruce to Adam of Carlisle of the lands of Kynemund. Duncan Adam appears to have accompanied James, Lord Douglas, on his travels to the Holy Land with the heart of Robert the Bruce.The architects, Robert and James Adam were sons of William Adam, also an architect, who claimed to be of the line of Duncan Adam. Robert and James are recognised as fine Neoclassicist architects of the late 18th Century. They drew inspiration from their studies in Italy between 1754 and 1757. The most famous examples are The Adelphi buildings in the Strand in London, which the brothers worked on together, and James Adam's Portland Place, also in London.The line of John Adam of Bliar Adam offers the most recognised characters. The Right Honourable William Adam of Blairadam, an eminent Scottish Lawyer is credited with introducing trial by jury in civil cases in Scotland. His son, Admrial Sir Charles Adam was a Member of Parliament and Governor of Greenwich Hospital. General Sir Frederick Adam became Governor of Madras following an injury at Waterloo. From the Biblical personal name Adam, which was borne, according to Genesis, by the first man. It is the generic Hebrew term for 'man', probably from Hebrew adama ‘earth’. Compare the classical Greek legend that Zeus fashioned the first human beings from earth. It was very popular as a personal name among non-Jews throughout Europe in the Middle Ages, and the surname is found in one form or another in most of the countries of Europe. Jews, however, have never used this personal name, except in recent times under Polish and English influence. Among Scottish and Irish bearers it is sometimes a reduced form of McAdam. 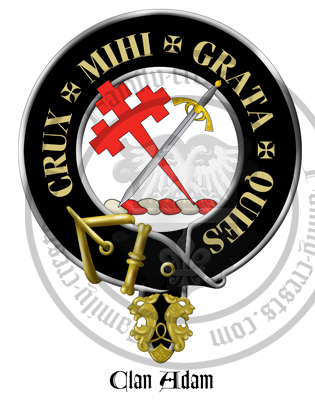 Crest: A cross crosslet fitchee gules, surmounted by a sword in saltire proper. Motto: Crux mihi grata quies (The cross gives me welcome rest).